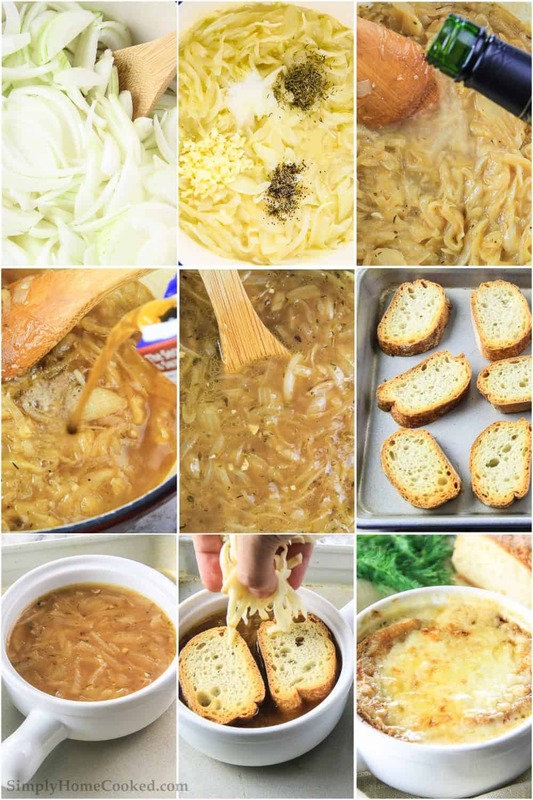 The first time someone mentioned french onion soup to me, my initial thought was, why would someone eat a soup made of onions? It didn’t sound appetizing at all. I never really cared to try it, but a few months ago my mother and I were out eating lunch and she decided to order french onion soup. It actually looked really yummy, especially all the melted cheese on top 😉 So, out of curiosity I just had to try it. I was so shocked at how delicious it was. Definitely did not expect it to taste so good. But of course, like most restaurant soups, it was way over salted. A few days later I tried making the soup at home. It would have been good, but I used regular onions instead of sweet yellow onions, and the soup ended up being very bitter. The second time I made it, it tasted so much better with sweet yellow onions. 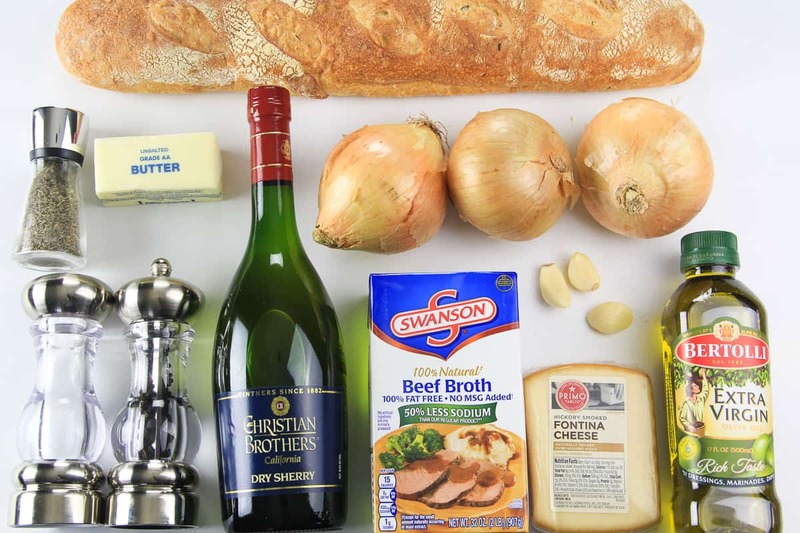 So if you set out to make this soup, make sure to use sweet yellow onions. 1. Slice the sweet yellow onion into strips. 2. In a heavy-bottomed pot, heat butter and olive oil over medium-high heat. Then add in all of the sliced onions. Cook the onions for about 15-20 minutes while constantly stirring. 3. Once the onion has slightly caramelized, add the minced garlic, dried thyme, salt, and pepper. 4. Drop the heat to medium and let the onion cook with the spices for about 4 minutes. 5. Bring the heat back to high and add the dry sherry. Stir for about 3 minutes to let the wine cook out. 6. Pour the beef broth into the pot and let it simmer for another 15 minutes. 7. Meanwhile, place the sliced French bread onto a baking sheet and bake in a 360 degree oven until golden brown. 8. Fill each oven safe soup bowl with the soup and place 2 pieces of French bread on top of the soup. Then sprinkled a layer of freshly shredded fontina cheese. 9. 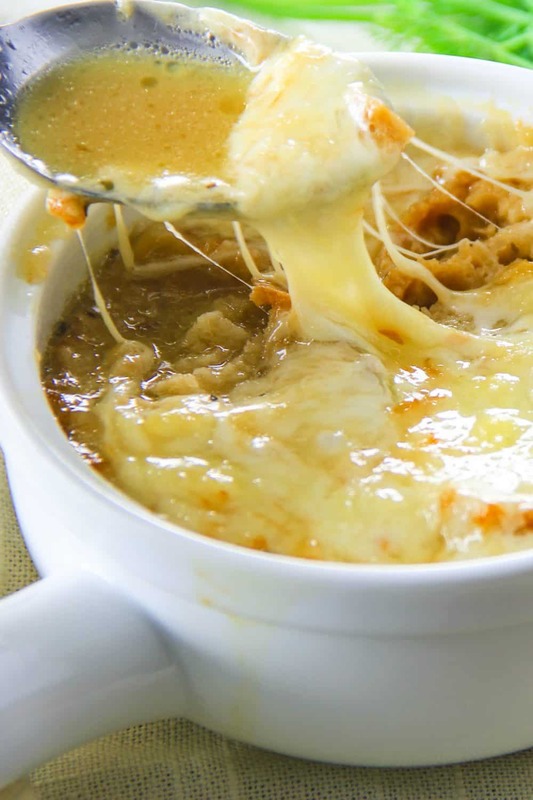 Broil the soup in the oven until the cheese becomes bubbly and golden brown. Note: if you don’t have oven safe soup bowls, the soup can still be enjoyed without the bread and cheese. Slice the sweet yellow onion into strips. In a heavy bottomed pot, heat butter and olive oil over medium high heat. Then add in all of the sliced onions.Cook the onions for about 15-20 minutes while constantly stiring. Once the onion has softened, add the minced garlic, dried thyme, salt, and pepper. Drop the heat to medium and let the onion cook with the spices for about 4 minutes. Bring the heat back to high and add the dry sherry. Stir for about 3 minutes to let the wine cook out. Pour the beef broth into the pot and let it simmer for another 15 minutes. Meanwhile, place the sliced French bread onto a baking sheet and bake in a 360 degree oven until golden brown. Fill each oven safe soup bowl with the soup and place 2 pieces of French bread on top of the soup. Then sprinkled a layer of freshly shredded fontina cheese. 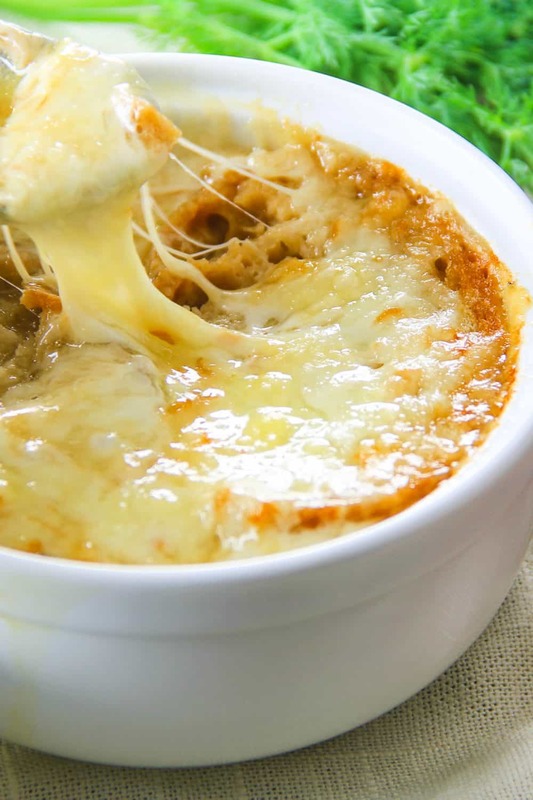 Broil the soup in the oven until the cheese becomes bubbly and golden brown.